Hi everyone. I just joined. This is my first post. I am lucky enough to own a 1976 W32. I am currently trying to get her ready for extended cruising/live aboard. Iv'e read quite a bit, all I could find, about the boomkin failures, and weather helm. So, I'm hoping to get a "review" for lack of a better word, or maybe just some advice on how the smaller sail area effects performance in light wind...or downwind..or any other points to consider.. The previous owner had a sayes rig on her. I bought a monitor, but I'm considering selling that if the shortened main would balance the sails well enough to use the sayes rig. I dont have any experience with either. Iv'e just read, and can see from looking at the two, that the monitor is a more powerful wind vane. remove the wood boomkin and add the stainless one Bud sells. The wind vain will fit with no problem. You can reduce weather helm by balancing the sails. for light wind just buy a spinnaker. 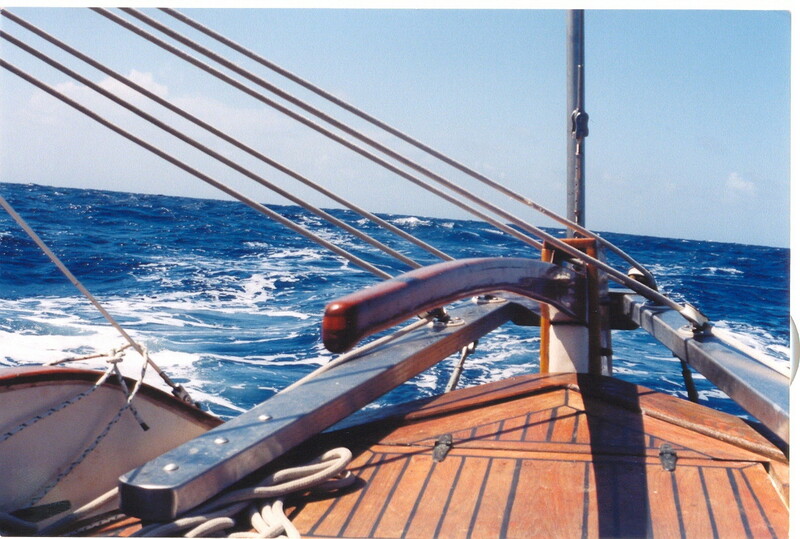 You can reduce the main sail by just reefing. No need for cutting and expensive mods. no matter what you do to it she just will not go to wind but in a close reach she takes off nicely. also slow on a run but if you come off the wind some she will again move faster. more sail is not always the answer to making the boat go faster. Thanks Norm and Doug for your advice and insight. Money is a factor, but I want to do things right too. Right now the boomkins off, mast is not up yet, need new sails, no boomkin chainplates. I have the wood for the boomkin but the crosspiece is bent. I'm definitely leaning towards two back stays. I like the Idea, it seams simple and a little less to worry about. both ways have there pros and cons. My plan now is to do the two back stays, get the mast up. then see how much of the boom i need to chop off. Then try to find a good mainsail to fit. Since I need new sails, it pretty much comes down to which way will sail better, not that I'll be in any hurry. Just to throw something else over your transom... consider keeping what you got, just use SS instead of wood. My local welding company would order something called "drops" for pennies on the price of "standard" lengths. I think "drops" means" pieces of SS that were not long enough to sell on the building market, but who knows....? I do remember, that availability was "when it became available!" I would measure, cut with my angle grinder, and they would weld. I also have pics of my bowsprit and Sampson posts. On the other hand, if you are not a die-hard DIY-er, I strongly suggest Bud's products. 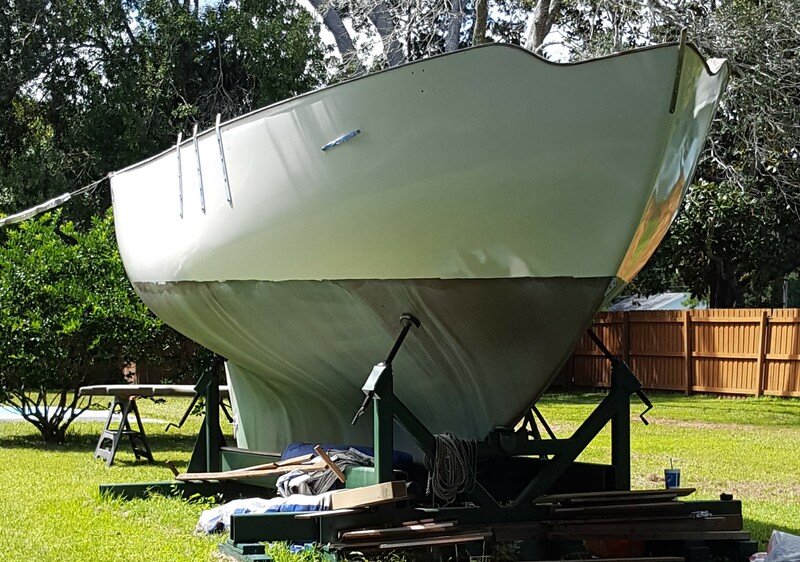 Not to hijack- but if you could post pictures of the sampson posts I would much appreciate it- I converted to Bud's stainless bowsprit and need to figure out new posts- Thanks!